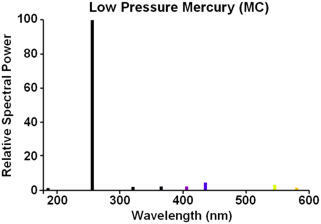 Germicidal lamps have a sharply defined spectral output at 253.7nm, the primary mercury line in the ultraviolet part of the spectrum. They consist of a low pressure mercury discharge operating under the same conditions as in low pressure fluorescent tubes, which ensures maximum efficiency in the generation of UV-C. The 254nm line is highly effective for the destuction of DNA, whose absorption spectrum shows a peak close to this wavelength. 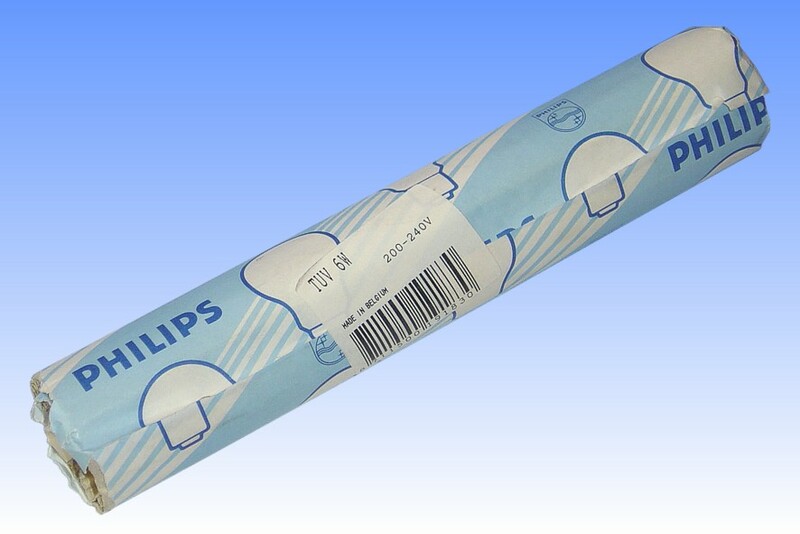 Germicidal lamps therefore require no phosphor coating to convert the UV spectrum into other wavelenghts, and are provided with a clear bulb envelope. The glass however is specially manufactured with a very low iron oxide content, the chemical normally responsible for giving glass its greenish colouration. It also makes most glasses opaque to ultraviolet radiation, so to allow transmission of the germicidal shortwave UV rays a special high purity glass is required. The germicidal glass is based on ordinary soda-lime grades and can be worked in the same way. 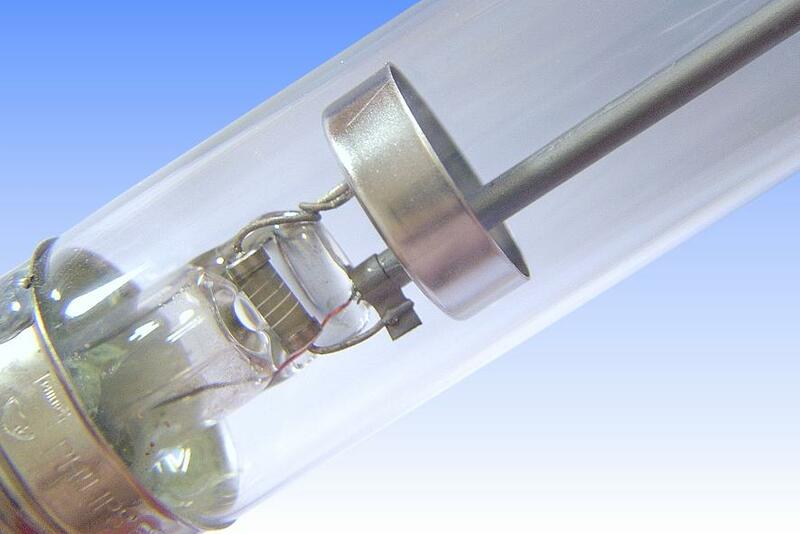 The TUV6 is a cold-cathode lamp operating directly from the 240V mains electricity supply. It contains a resistance in the base to limit the current between the pair of cup-shaped electrodes. 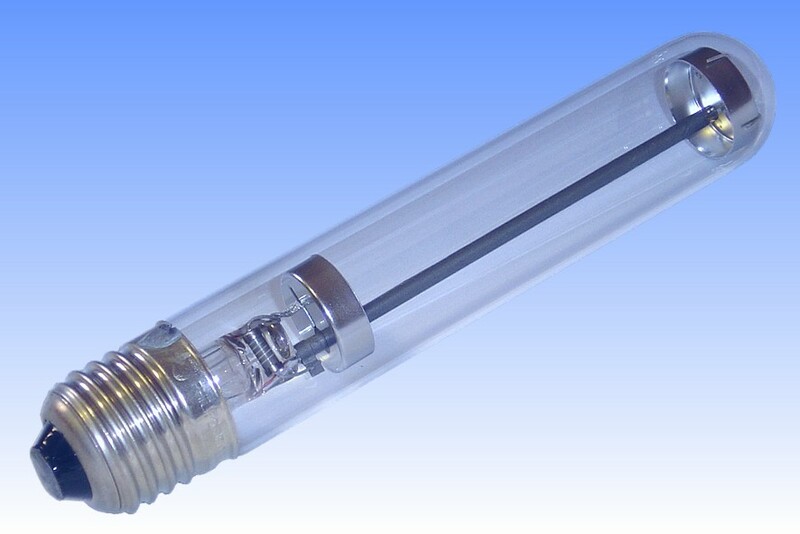 The lower electrode is connected directly to one terminal, the upper is connected to the other and its supply wire is sleeved in a glass tube painted with colloidal graphite. The conductive graphite layer is connected via a high resistance to the lower electrode, and it forms an auxiliary starting electrode in just the same was as high pressure mercury lamps. The gas-filling contains neon for easy ignition, whose presence can be revealed thanks to its reddish-orange light when the lamp is operated on DC. References: 1) Philips UK Lamp Catalogue, 1992. 2) Philips UK Price List, 1995.